Note the (toppled) stack of what appears to be portable railway track in a fairly narrow gauge (24" or less?) near the foot of the weir. The site is the irrigation flumes/ditches of the McBryde Sugar Company on Kauai circa 1910. I have also run across a photo showing the remains of some portable track used in the construction of the levadas on Madeira. I had run across irrigation flume or pipeline construction railways before (in Canada, Puerto Rico, the USA, Argentina and more) but not many using portable track panels of such narrow gauge. I would be interested to see the Madeira Levada photo as use of any track in building these waterways would have been very limited. Have walked them many times and the only construction details I can find are descriptions of workers being dangled in wicker baskets against rock face to chip away at rock by hand. Many levadas pass through tunnels and you can emerge from one in a concrete channel with sheer drops on either side before entering yet another tunnel. 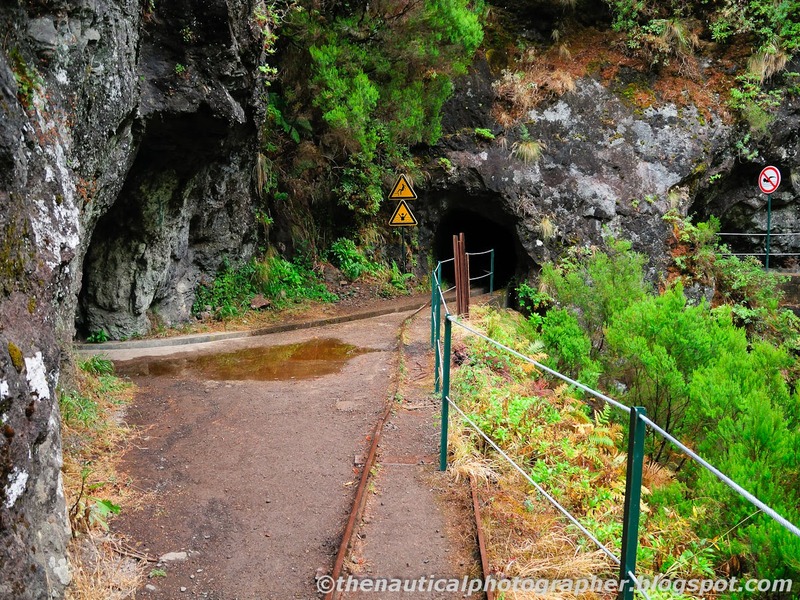 I have had a Tour Guide check the Funchal museum and there is nothing recorded about track being used in Levada construction. One used in the Construction of Avenida do Mar in 1888. The other on the Funchal Monte Rack Railway. Monte was connected to Funchal by the railway, which used to carry passengers between Funchal and Monte and further up to Terreiro da Luta at 867 m above sea level. The railway was inaugurated in 1893 and operated until 1943. A boiler explosion occurred in 1939 killing 4 people resulting in a loss of confidence in the system. Talk a few years back of restoring it however part is now a road and the more effective solution, a cable car, now operates twixt Funchal & Monte. According to the photographer the tunnel was cut in 1971, so it may be more modern portable track. The system is the Caldeirão Verde/Caldeirão do Inferno levada. Thanks for the other images. The picture of the ogee tank narrow gauge loco is of great interest. It looks to have been built by one of the Scottish builders. Would it be possible to identify the contractor carrying out the road works? hecla777 wrote: The picture of the ogee tank narrow gauge loco is of great interest. It looks to have been built by one of the Scottish builders. Would it be possible to identify the contractor carrying out the road works? Not unless you fancy a trip to Madeira, I have spent hours searching web -nothing, even asked a tour guide about the Funchal museum & railways. I see that there was a short lived 60cm gauge horse drawn tramway in Funchal too. Again Martin the archive is pretty sparce. I've searched in Portuguese and turned up nothing more than I can find with an English search; just a few photos which I'll post when I can log-on to PC. Here's the photo of Aljube Street in Funchal showing tram track with passing loop around 1900. Same Street, date shown as same , rather unlikely. Same time. passing loop removed with typical sledge transport across track. Finally several photos I've found with trams. Yesterday had only located one; these are all in public domain. Last but not least a carnival? procession with a Carro Americano. Amazing what's out there to be found with a little persistence. Just found two more with a tad of lateral thinking - next post. Two more photos showing just the tracks. Ponte do Torreão, Funchal - Bilhete-postal. Ponte Nova da Rua dos Netos sobre a Ribeira de Santa Luzia, Funchal. These photos are all said to be c1900. Another photo of Monte Rack Railway. I think that this is the Funchal terminus. Found all these Martin whilst trying to locate anything about the building of the Avenida do Mar using an Industrial Railway. Problem is that most search results are from Brazil (same language) inspite of searching for Funchal Madeira. Have given up. Wow that is impressive many thanks!